Show up with CBD infused treats this holiday season to help your friends and family feel calm, cool and collected. 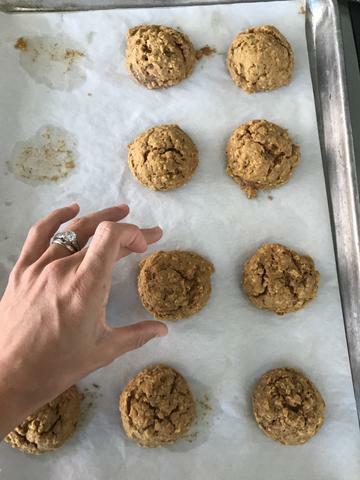 Together with chef Angie Marin we made these delicious spiced pumpkin and maple cookies. They taste like a scone and a chewy cookie had a delicious, little chill baby. 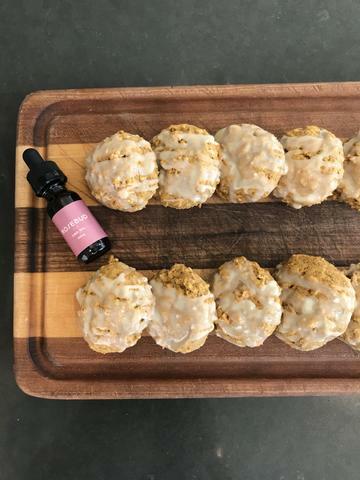 This recipe yields three dozen cookies, each with about 3.5mg of CBD. Preheat oven to 350 degrees F. Line a large cookie sheet with parchment paper or a silicone baking mat. Set aside. In the bowl of a stand mixer, beat butter, brown sugar and granulated sugar until light and fluffy, about three minutes. Add egg, vanilla extract, and CBD oil. Beat until combined. Mix in the pumpkin and maple syrup until smooth. Gradually add half of the flour mixture, scrape sides down and add the remaining flour. Be careful not to overmix – you want to just get to the point where you don’t see any remaining dry flour. Stir in the oats. Set the cookies aside the cool. In a medium bowl, whisk together melted butter, powdered sugar, maple syrup, vanilla extract, milk, and CBD oil (if using). Whisk until smooth. The more milk you add the thinner the glaze will be. Depends on your preference. I like a thicker glaze!